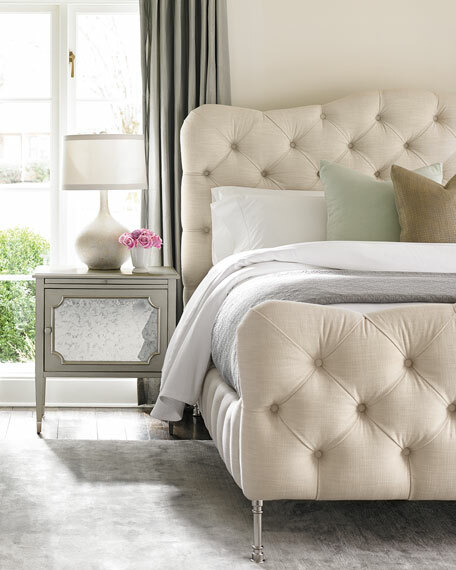 Create a romantic bedroom centered around this chateau-inspired bed. Casually elegant design channels the original that was discovered in a charming chateau in the south of France. 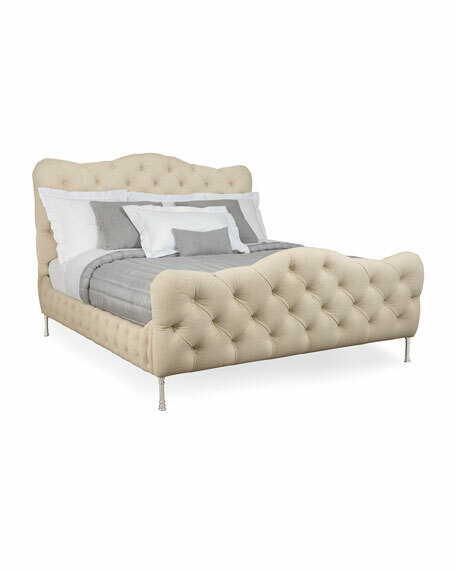 A deeply tufted headboard, footboard and rails are clad in a natural hued linen. 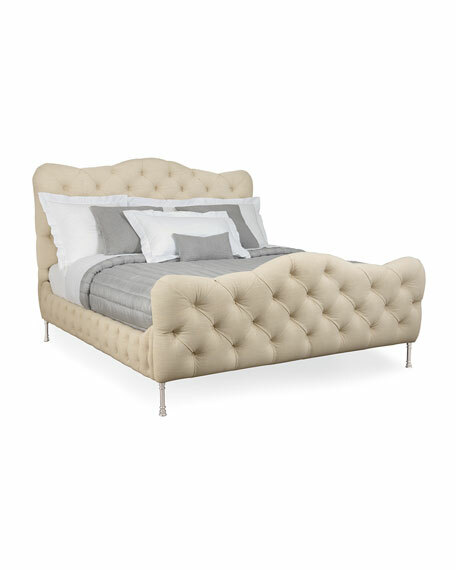 The bed rests atop metal feet, an authentic detail taken from the original antique, lending this bed an unmistakable provenance. Bed sits on rails; box spring needed. Assembly required; hardware and instructions included. 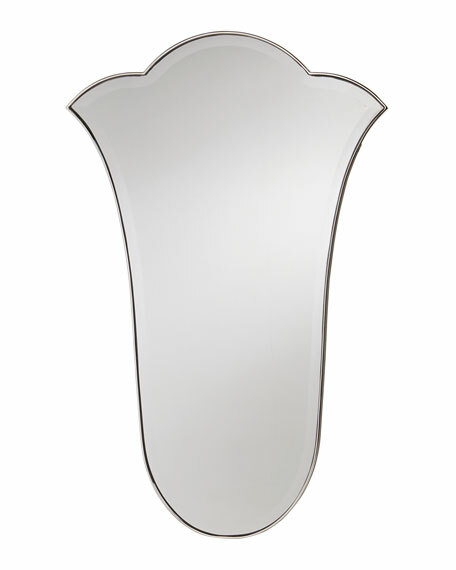 Overall, 82"W x 96"D x 63"T.
Reflect a sunny disposition with our whimsical tulip-shaped mirror. Its flowing, organic shape offers a unique, light-filled focal point over a dresser or in the bath. 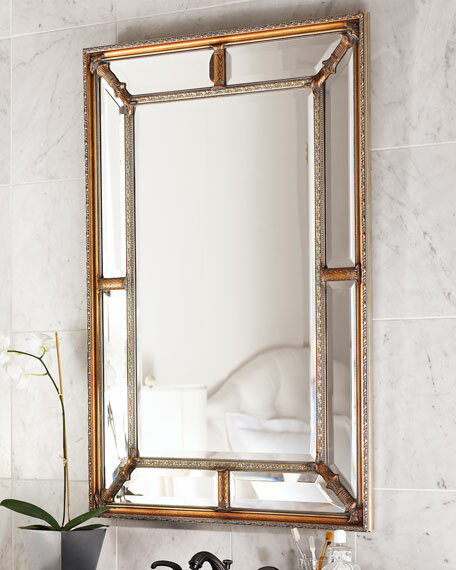 A Polished Silver metal frame gives definition to the mirrored glass. Overall, 27.3"W x 2"D x 42"T.
Weight, 20 lbs; Boxed weight, approximately 30 lbs. Overall, 66"W x 92"D x 63"T.
Overall, 82"W x 92"D x 63"T.
Boxed weight, approximately 155 lbs. 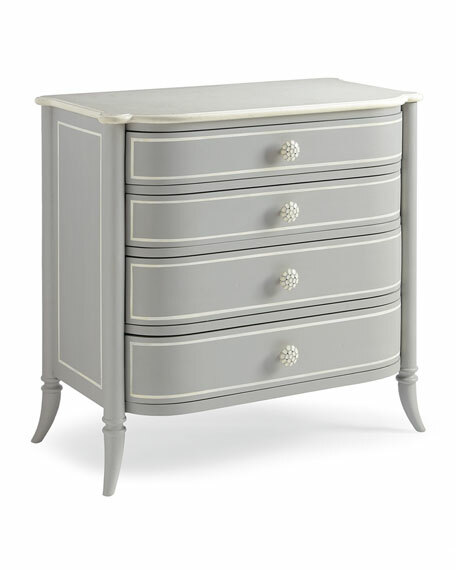 Painted in today's newest neutral, a classic French Grey Paint, this beautiful little four-drawer chest offers impeccable details in a soft yet elegant palette. 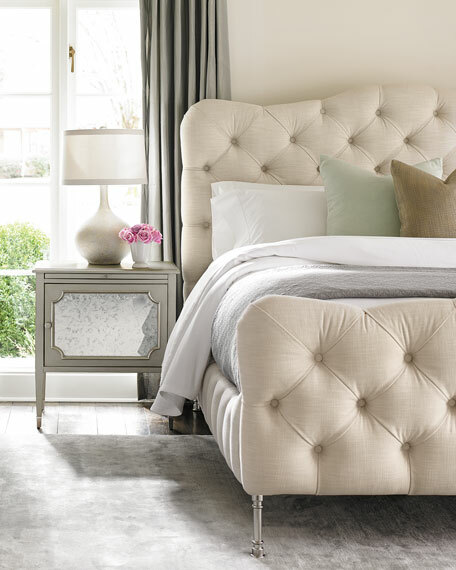 Crisp, white accents add a shadowbox detail to its feminine silhouette and drawer fronts. Whimsical hardware further enhance her endearing personality. Painted the drawer interiors a beautiful soft grey and finished the drawer bottoms with a decorative French-inspired "faux bois" pattern. 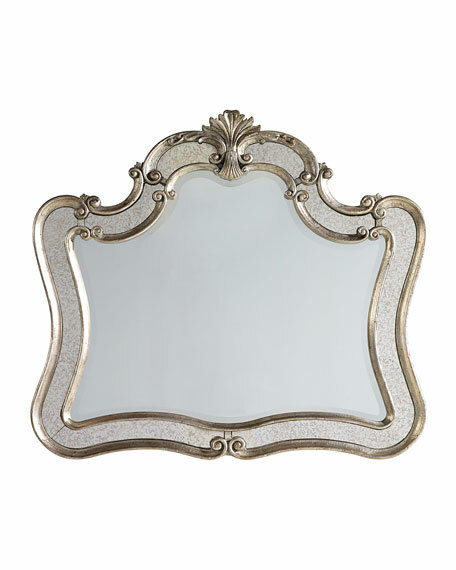 For added sophistication and durability, a creamy white stone top finishes off this precious piece. Drawers have painted interior with patterned bottoms. Overall, 33"W x 18.5"D x 31.3"T.
Boxed weight, approximately 165 lbs. 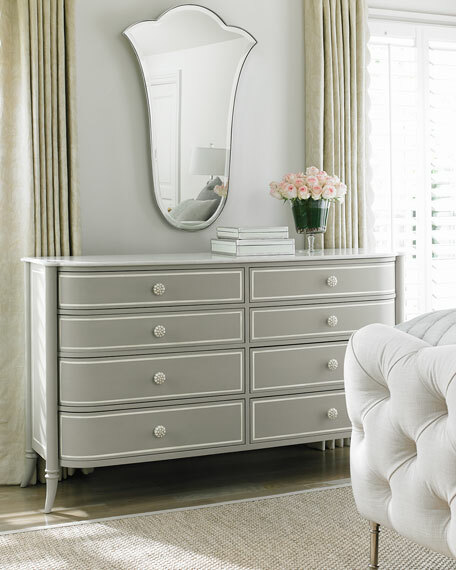 Classically-inspired, thin white accents add crisp detailing to the dresser's sides and eight drawer fronts. Playful hardware adds an appealing touch of whimsy. 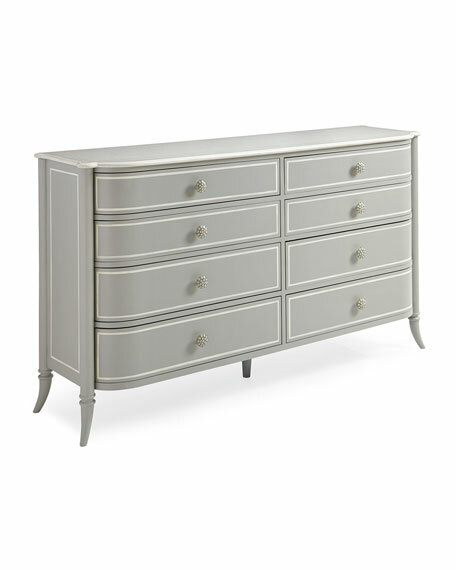 An elegant creamy white stone top gives this dresser a refreshed look and ties beautifully with the dresser's detailing. 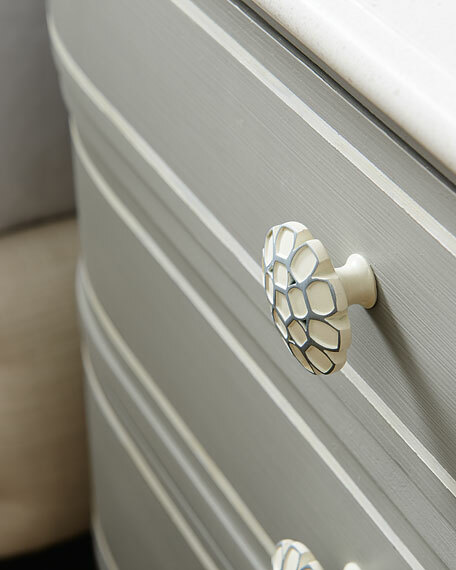 Painting the drawer interiors a beautiful soft grey and finishing the drawer bottoms with a decorative French-inspired, faux bois pattern. 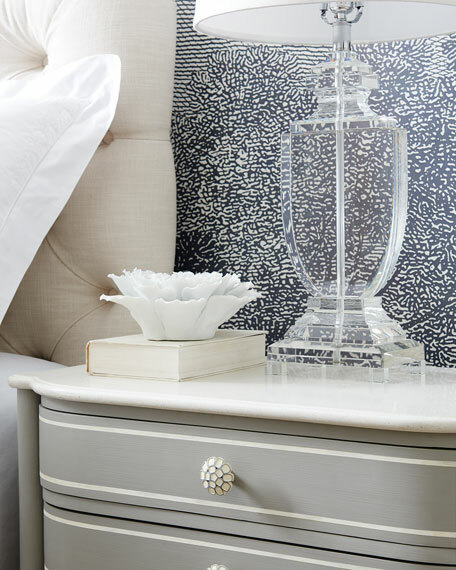 A removable, felt-lined jewelry tray and chic eye-wear organizer complete this stylish dresser's offering. All drawers have pattern bottoms and painted interiors. Removable jewelry and eyeglass tray in top left drawer. Overall, 66"W x 19"D x 38"T.
Boxed weight, approximately 321 lbs. 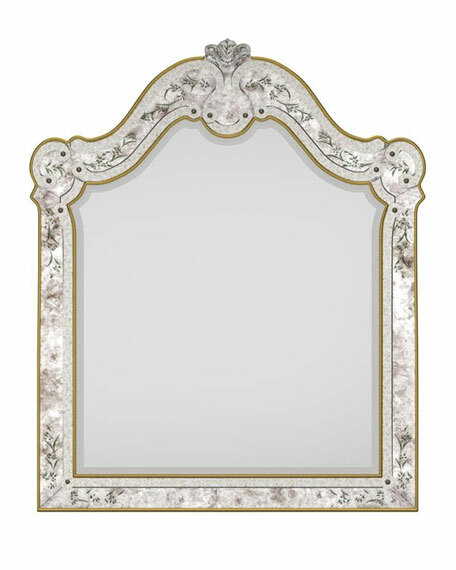 Mirror framed with scroll motifs.Hand-painted vine and leaf etchings on frame edges.Mercury-glass and eglomise accents.Inset brass trim.39"W x 1.5"D x 47"T.Assembly required.Imported.Weight, 44 lbs. Boxed weight, approximately 60 lbs. 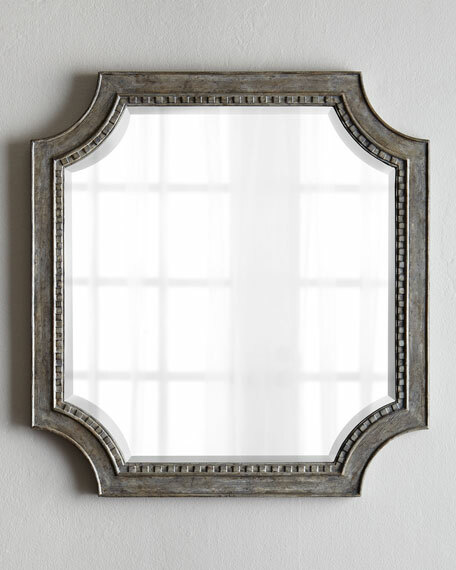 Handcrafted beveled mirror with inset molding.Hardwood frame.Soft driftwood finish highlighted with light gray and whitewash tones.42"W x 1.5"D x 39.5"T.Imported.Weight, 51 lbs. Boxed weight, approximately 77 lbs.